At the Sonoran Desert National Monument, Arizona in August of 2008 I found at least one of these grasshoppers inhabiting every Creosote Bush (Larrea tridentata). In the heat of the day, during the hottest months in the Sonoran Desert, clickers can almost always be heard. 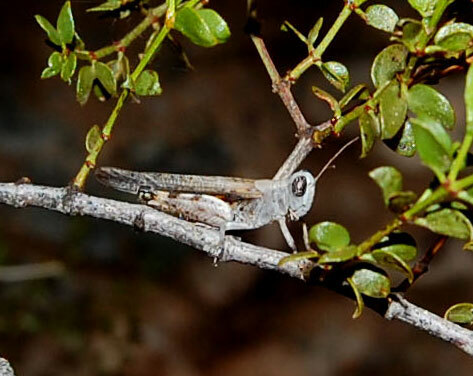 They are small slant-faced grasshoppers (Gomphocerinae) barely 16 mm long. When clicking they are perched usually on a creosote branch that is matched to their own color - various shades of gray-brown. They have excellent vision and move to the opposite side of the stem when approached. Thus easy to be heard, but difficult to spot even as they continue calling. This is just one of many herbivorous insects that has moved to feeding on creosote bush, a relative newcomer to the Desert Southwest. Desert Clicker grasshoppers feed on a variety of desert plants, but show a strong preference for Creosote Bush (Larrea tridentata). Male Desert Clickers maintain a territory mostly in shrubs that have a lower concentration of the protective phenolic compound nordihydroguaiaretic acid, i.e. there is variation from one creosote bush to the next. The males begin incessant clicking sounds at dawn and continue well into the night. Rival males are chased away and females can be assured that the male has identified a good food source (Greenfield et. al, 1989, J. Anim. Ecology, Vol. 58, no. 3, pp. 761-771).